I don’t manage to keep much track of what I read but here’s a few of the books I read towards the end of last year. Mist over Pendle by Robert Neill. One of my favourite novels: the story of a young girl moving to live with a distant relative in Lancashire at the time of the witch trials. You learn a lot about the clothing of the time in this historical novel. The heroine is a lovely character, but rather too twentieth-century to be believable. Snoop by Sam Gosling. I spend a lot of time in other people’s houses and this book is all about what you can tell about character based on people’s living environment. The main conclusion is that you can’t draw as many conclusions from surroundings as you think you can. Lingo: A language-spotter’s guide to Europe by Gaston Dorren – Having read this in the summer, I fancied another go through it over Christmas. The little snippets about rare languages are really interesting. It must be having some impact as I was chuffed to be able to identify some European languages correctly in a University Challenge picture round. Lord John and the… by Diana Gabaldon. After the midnight service on Christmas Eve when it was 1am, I was wired and full of adrenalin, I needed something short to read in order to calm me down enough to sleep so I could be at work again within 8 hours. This turned out to be the first Lord John short story: Lord John and the Hellfire Club. I’ve carried on and read all the others since then because why not? Shades of Grey by Jasper Fforde – no, not the book you think I mean. This is one of my favourite books ever, a distopian futuristic fantasy where the level of colour vision people possess is their defining feature. It was meant to be the first in a series, but the series has never been forthcoming. Very clever writing. Soulless, Heartless, Timeless & Blameless by Gail Carriger. First four books in The Parasol Protectorate series, a steam punk setting with vampires, werewolves and accessories. The main character is so pragmatic in a world where no-one else is. I read these a few years ago and loved them. I treat these as a fluffy dessert: no real substance, but a delight to read. The Host by Stephanie Meyer. I read this before I read all the Twilight series. The Railway Children by E. Nesbitt. We went to see the stage production of this in the summer at the National Railway Museum, so I decided to re-read this afterwards. The Christmas Mystery by Jostein Gaarder. I read this during advent and really enjoyed the gentle retelling of the nativity, along with a missing person mystery. Red Moon Rising by Pete Grieg. This was a freebie on Kindle and is the story of the 24-7 prayer movement. I found it really inspiring and a good reminder of the effectiveness and impact of prayer. Gail Carriger – Changeless, The Curious Case (prequel novella), Curtseys and Conspiracies, Etiquette and Espionage, Waistcoats and Weaponry, Manners and Mutiny. Having re-read the first few of Gail’s books (above), I rather binged by buying the rest on Kindle. The four finishing-school books are aimed at a younger readership, but still maintain that glorious cynical tone and balance of frivolity and menace. Big Magic by Elizabeth Gilbert. This is the book that inspired my commitment to writing more this year. It probably deserves a post of its own at some point. Final Witness by Simon Tolkien. You can guess why I picked this up. This is written by the grandson of the great JRRT. It’s a while since I read it, but I remember really enjoying the behind the scenes view of the legal world. There’s three more books by the same author that I’m hoping to get to before too long. Longbourn by Jo Baker. Behind the scenes of Pride and Prejudice. This was a Christmas present from my lovely sister. P&P has been a favourite since my teens and this gives an interesting counterpoint to it. The author has taken everything she possibly can about the servants that appear in P&P (actually strikingly little) and woven a narrative around them. This was the perfect antidote to a couple of weeks of overwork. 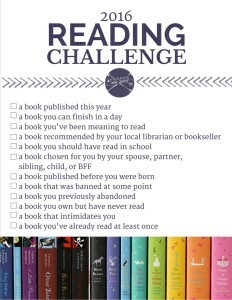 I found an interesting reading challenge that doesn’t seem too arduous. a book published this year. This shouldn’t be hard. I have the new Ben Aaronovitch on pre-order. a book you can finish in a day. Plenty of scope here. a book you’ve been meaning to read. I have shelves full of stuff I’ve been meaning to read. a book recommended by your local librarian or bookseller. My nearest bookseller is White Rose Books in Thirsk. I’ll go and ask them. Our local library is going to be down-graded to a community-run facility in the coming year. I’ve thought about volunteering there. a book you should have read in school. 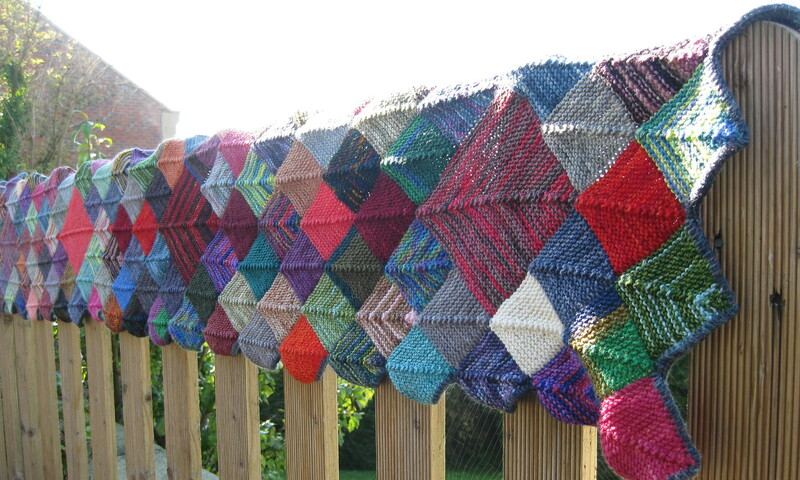 This one is a puzzling one and I can’t quite get a handle on it. I’m pretty certain I read everything that school required at the time. Following a conversation on Facebook this week, I’ve received several selections from friends of things they think I should have read. a book chosen for you by your spouse, partner, sibling, child, or BFF. This won’t be hard. My sister teaches English and is full of good ideas for stuff I might like. a book that was banned at some point. Presumably it doesn’t matter where it was banned. Looking forward to this one, although I’ll choose something that was banned for political or religious reasons rather than Lady Chatterley. I’ll go in search of the banned books list from the Vatican. a book you previously abandoned. Shall I give Jonathan Strange and Mr Norrell one final chance? It turns out that part of the recent tv adaptation was filmed in our village. My other tip for this category is Gormenghast, but I’ve lent it to someone. If neither of those comes to anything I suppose I could try Wuthering Heights again, although I really hated it (a friend of mine burnt their copy because they hated it so much). a book that intimidates you. This requires some thought. I’m not easily intimidated by books. a book you’ve already read at least once. See the section of re-reads, above. This will not be hard to fulfil. I adore re-reading old favourites. It’s like spending time with an old friend. In order to make this a little more interesting, I’m going to stipulate no re-reads except the final category and the partial re-read for the abandoned category. I wonder how long it will take.